A new tea vendor caught my eye a few months back. Their site was clean to look at, their teas were tempting to read about, and their aesthetic was absolutely gorgeous. BitterLeaf Teas certainly made a splash, what with their nature-themed tea names and clean lines. But since the Canadian dollar was going down the tubes, I watched (and thirsted) from afar. Until about a month and a half ago, that is. That’s when they announced a flash sale to cap off a successful trip to various tea festivals across the West Coast and get rid of any remaining inventory they still had before returning to China. They offered cheaper shipping to boot — so of course I couldn’t resist. I ended up buying two teas and got another three free samples included in my package! Even better, two of the samples are of teas that BitterLeaf hasn’t even started selling yet. So here’s a sneak peak of some teas that BitterLeaf is planning to offer in the near future. 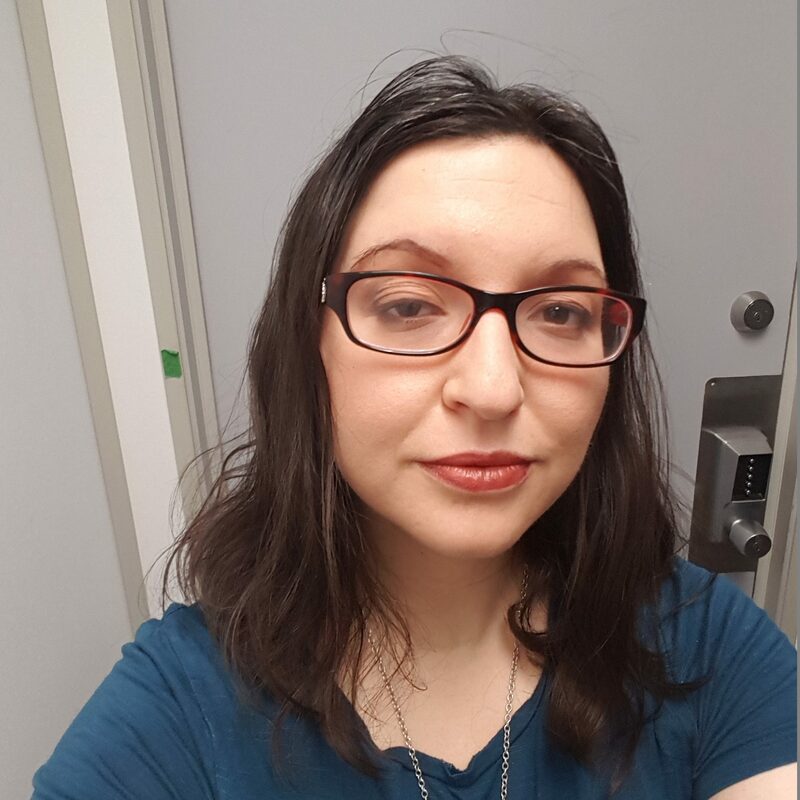 I feel like such an insider! 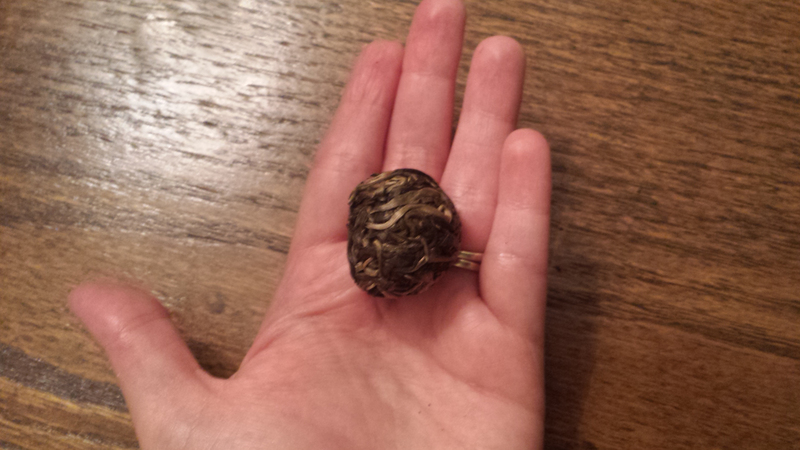 Our Ice Queen 2007 Spring Bing Dao Ancient Tree raw Puer is easily the crown jewel in our tea collection. This exceptionally smooth and drinkable tea has a strong taste of honey from the moment it hits your lips until well after you’ve finished drinking, not to mention an extremely sweet scent that remains in your cup. BitterLeaf gave me a free 7-gram sample of this with my order, along with brewing instructions. I followed them as closely as I could, using 95°C water, a quick rinse, and then steeps ranging from 3 to 8 seconds. 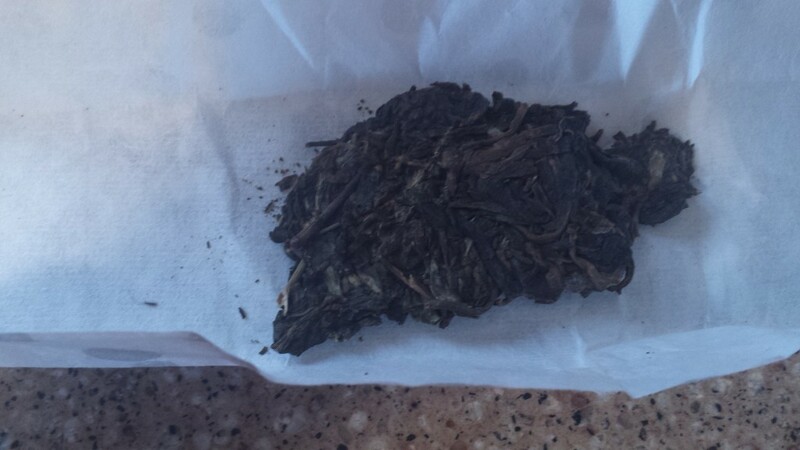 The dry leaf was brownish-green with a few golden tips, and didn’t give off much smell. Rinsed, though, it as a different story: the wet leaf gave off aromas of earth, grapes, tobacco and hay. The first few steeps were pale and mild, but over time both the colour and the flavour deepened, going from grass and smoke to a tart sweetness like grapeskin and quince. (Quince! So astringent, but so satisfying to chew!) The first steep was a pale golden amber, but the following few steeps were a lovely deep amber with a green overcast — looking at my cup, I couldn’t help but think that I was about to drink some very fine, very rich olive oil. However, it didn’t feel like olive oil in my mouth. 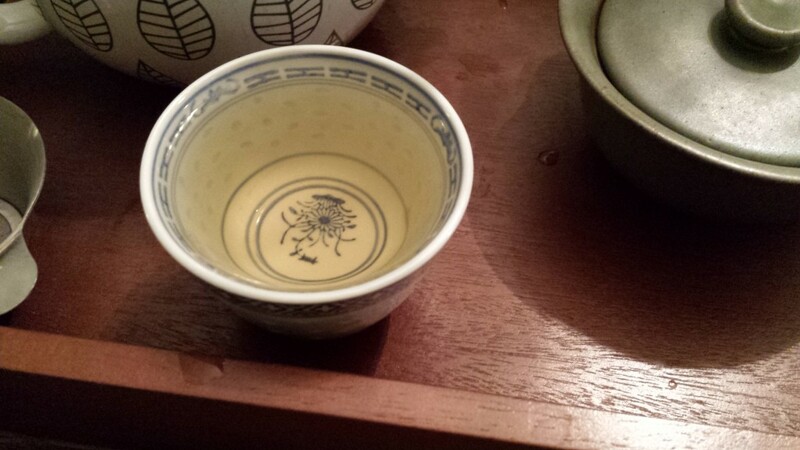 Instead, it had a very clean feel on my tongue; not thin like water, but not thick like broth. “Lively” is the best word to describe it — like I was drinking something sparkling and vital. 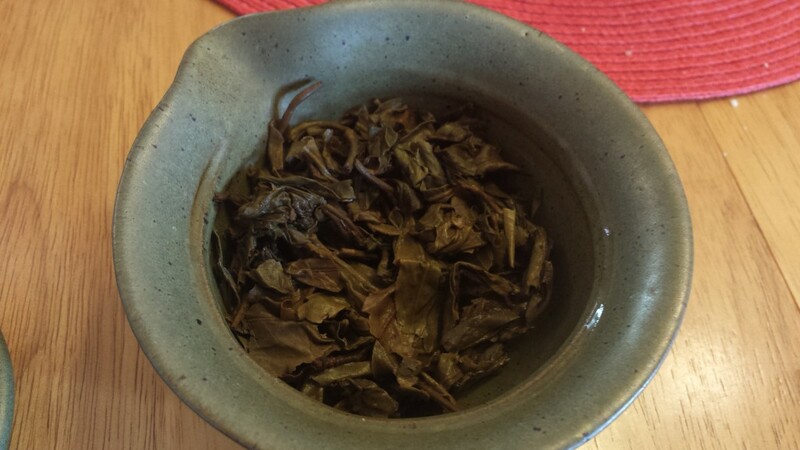 As the steeps continued, the depth and rambunctiousness of the second, third, and fourth steeps gave way to something that was mellow and incredibly well-balanced: the tea grew earthy, tart, and astringent, but no single aspect dominated the others. I eventually went through 10 steeps, and even after the 10th steep the tea was still a rich amber colour with flavours of sour grapes and grapeskin. I have no doubt I could have made the tea go beyond 10 steeps, but I really didn’t have the time or inclination to test that assumption. In the end, I was left with a lovely vessel full of olive and russet leaves. You can buy Ice Queen 2007 Bing Dao tea here. We may list the LBZ [for sale on the site]. Not sure. We have various factory cakes sitting around aging at the moment. If it’s not that, there are other factory cakes that may be added. This will most likely happen along with our spring 2016 pressings. They sent me a free 7.7 gram sample along with my order. This amount was too small to break down into two sets of leaf, but a bit bigger than what I normally brew at once; to compensate, I decided to take the whole thing and do really, really quick steeps to ensure it didn’t taste too strong and overwhelming. As with the Ice Queen tea above, I used 95C water. The dry leaf was a compact chunk of dark brown and green, with no white leaf tips. However, the smell was very fruity. Because the chunk was so large, I did two quick rinses of 5 seconds each to try and soften it a bit and make it easier to steep. The rinsed leaf smelled smoky, fruity, and sour. I could tell from the first steep onwards, though, that this thing had staying power, as I could sense a lot of flavour just beginning to wake up. 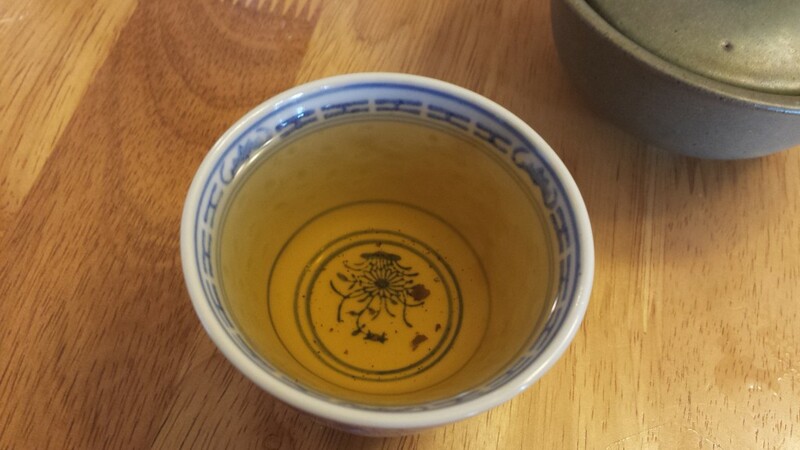 As with the Ice Queen tea, the subsequent steeps gave off a liquor that was amber with greenish overtones, so the whole cup looked like rich olive oil. From the third steep onwards, I got a note of fresh green wood, plus fruit. Slightly drying, but not harsh. As I continued through the first pot, I tasted notes of damp forest floor, honey, plums, and grapeskin; the texture was very smooth, but I noticed my mouth pucker over time. After about 8 steeps, I started to feel some gauziness and astringency on my tongue, but the tea was still very smooth and clean. Then I started to feel a crinkly, drying sensation at the top of my throat leading down to my esophagus. Soon afterward the pot of water was empty; I stopped for the morning, went on some errands, and resolved to try a second pot of tea in the afternoon to see if it had staying power. The second pot of water produced some really different results! 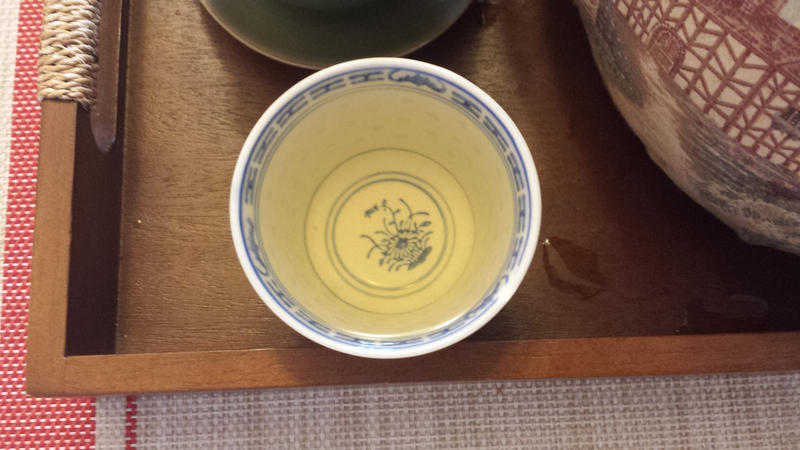 At first, I was surprised by how bitter the steeps tasted, until my tongue acclimated to the tea again around the fifth steep from the second pot. 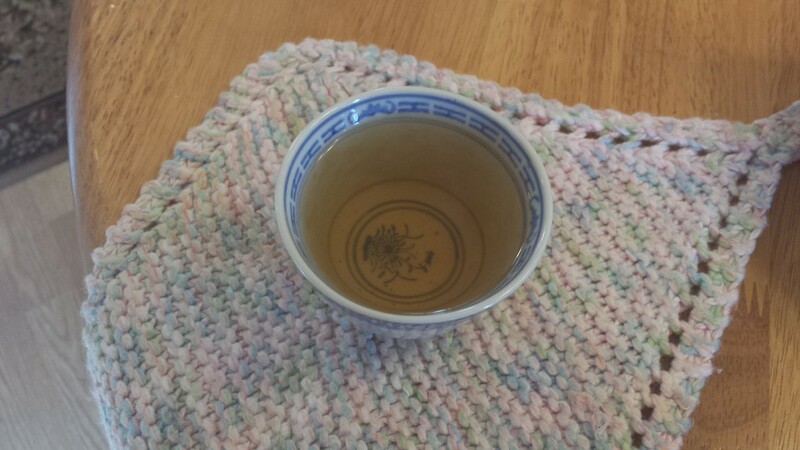 This time around, after I got used to things, I noticed that the tea was really fruity, with stonefruit notes of apricot and nectarine making a big appearance. The liquid itself was still a rich amber. However, over time, I could finally sense that the leaf was fading; a real, genuine note of olive bitterness joined the cup, and then the whole thing turned pale and mineral. I lost count of the steeps at this point, but I’d say that with 2 pots of water, I easily got 15-20 steeps out of this leaf! The spent leaf was a dark green that reminded me of cooked spinach. 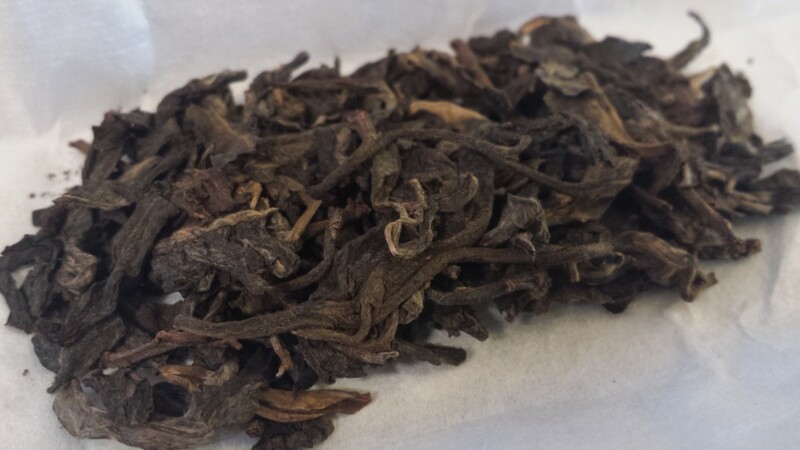 We’re 90% sure the Yiwu will be added to our lineup, but it will be the 2016 version. We’ve been drinking this farmer’s tea from the last 5-6 years and really enjoy them and how they progress, so we’re excited about that one. 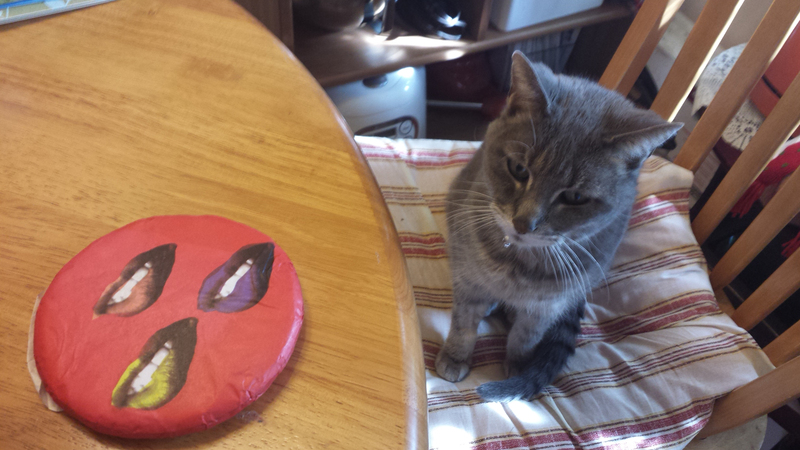 Unfortunately, I don’t share their excitement. 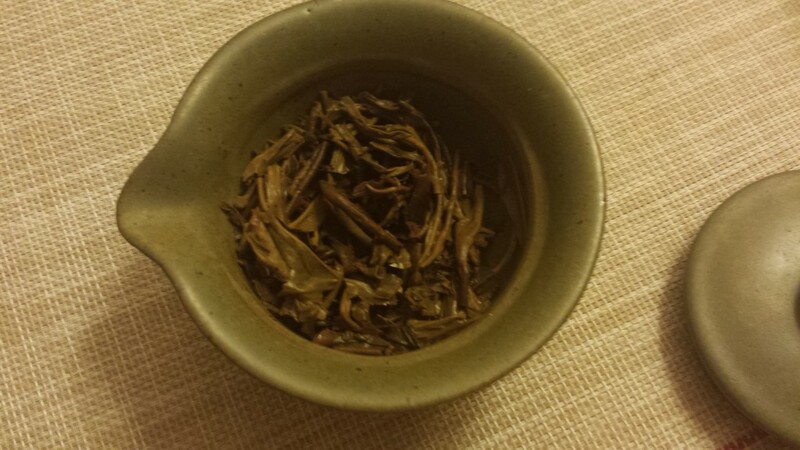 They gave me a whopping 14 grams to play with, and after doing a traditional session with 6 grams of leaf in my gaiwan, it didn’t really taste like anything. There was smokiness and sourness, but it felt like the bones of another tea — there was no unexpected note, nothing that gave the tea life. 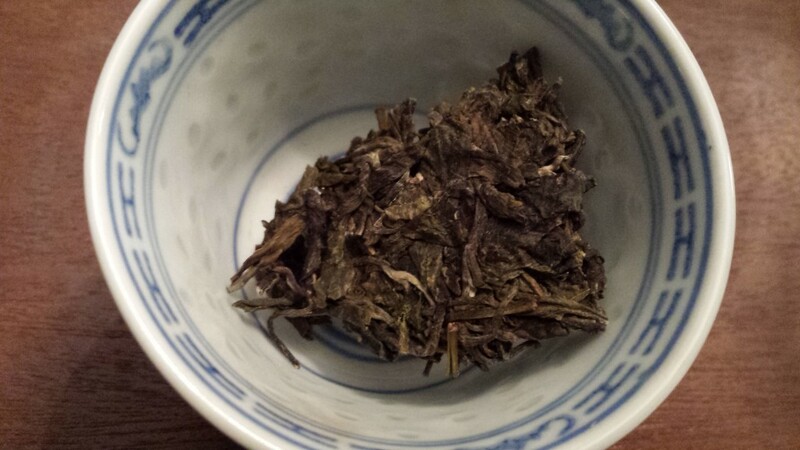 I used the remaining 8 grams of leaf and brewed it using a regular tea mug, but that was similarly underwhelming: at most I got a sense of something sweet and a little sour, but it felt like an approximation towards tea, and not the real thing. Considering how much I enjoyed the other two teas mentioned above, this one was a real disappointment. It just didn’t have the richness, either in colour or in flavour, of its compatriots.